A HEALTHY lifestyle should be at the forefront of people’s minds with the threat of alcohol related deaths and obesity in the UK on the rise. 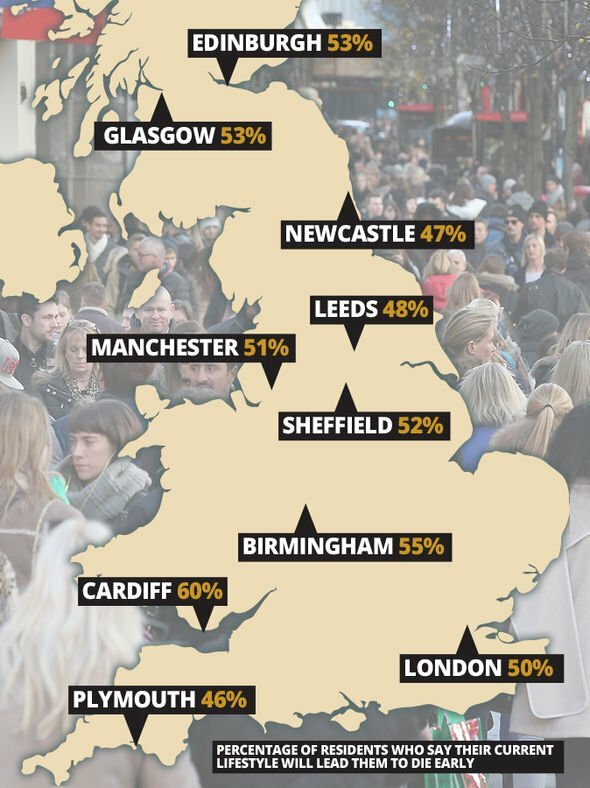 As part of a new survey to raise awareness of these problems, Britain’s unhealthiest city has been revealed. Cardiff has been named the unhealthiest city in the UK with as many as 60 per cent believing their current lifestyle will lead them to an early grave. Researchers surveyed adults in major cities across the UK and found that Birmingham, Sheffield, Glasgow and London were also among the unhealthiest in terms of the amount of alcohol they drink, how little they exercise and the amount of processed, high sugar foods they consume. In fact, as many as 58 percent of Glaswegians think that their current lifestyle is so unhealthy, it will most likely lead them to die early, as do as many as 50 percent of Londoners. It also comes on the back of data from NHS Digital, which revealed one in twenty British women (five percent) are now classed as morbidly obese while two percent of British men were also grossly overweight – with the bill for obesity-related illness now costing the NHS a staggering £4billion a year. It found more than a quarter (26 percent) of the adult population feel the stresses and strains of modern life are the main barrier they face when it comes to maintaining a healthy lifestyle, leading to habits and addictions such as overeating and binge drinking. And 43 percent of the nation do not consume the five portions of fruit and veg a day that they should, while four in ten never do the 30 minutes of exercise a day recommended by the NHS. In terms of exercise, 28 percent of those polled confess they lack the motivation, 19 percent said it was too expensive, and the same number said they simply do not have the time. Daniel Sobhani, CEO of Freeletics, which commissioned the study as part of its Dare To Be Free campaign, said: “It’s extremely worrying that the majority of the nation are not living the healthiest lives they could be. “Our study revealed a myriad of common barriers that get in the way of people being healthier and more active, and the fact that a shocking 88 percent feel powerless to change their lifestyle is something we want to change. The research also looked at the weakest excuses that people give for not exercising, with bad weather (18 percent), wanting to catch a TV show (12 percent), and not wanting to get too sweaty (7 percent) featuring on the list. A total of 2,000 Britons were surveyed across major UK Cities in the UK by Ginger Research on behalf of Freeletics in January 2019. In 2017, the top five overweight cities and towns in the UK included Boston – with 34 per cent obese, Barnsley, Mansfield, Rotherham and Fenland.